The most important poker stat is VPIP, hands down. VPIP, short for voluntarily put money in pot, is a preflop stat that tells us how often a player is putting in money given the opportunity. 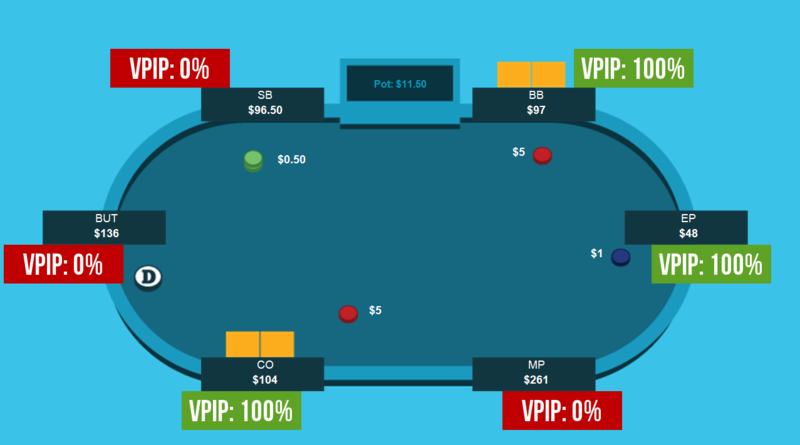 Limps, calls, raises, and 3bets all count as VPIP, but what is a high vs. low range? Watch this video to get an idea on how to calculate and visualize this stat. Or if you are the reading type, the script for this video can be found below. Enjoy! Hello and welcome to this Quick Plays video on VPIP. Online poker players using a hud, or considering using a hud, are inundated with a ton of stats to choose from. But the most important stat by far is VPIP. In this video we’ll discuss what this stat is, how it works, and its application when analyzing your opponents. First, what is VPIP? VPIP stands for voluntarily puts money in pot and is a preflop stat. You may see this written online as VPIP or VP$IP, but they both mean the same thing. The legacy formula for VPIP is simply the Number of Times Player Put Money In Pot / (Number of Hands). So if a player played 80 hands and voluntarily put money into 15 of them, he would have a VPIP of 19%. 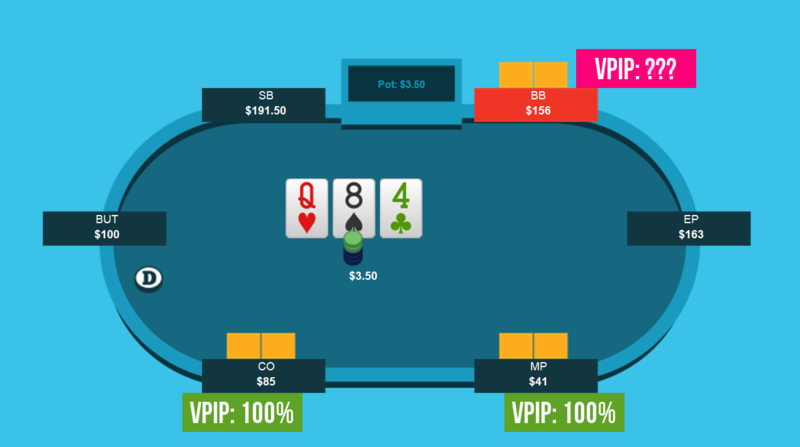 Let’s analyze each player’s VPIP for this single hand. In this hand UTG open-limps for $1. He has voluntarily put money into the pot and would have a VPIP of 100% for THIS hand. MP folds and thus didn’t voluntarily put money in and would have a VPIP of 0% for the hand. The CO raises to $5 and due to his voluntary raise also gets VPIP for the hand. The button folds, giving him a 0% VPIP and the SB folds as well. Now players new to the concept may be confused because the SB did put money into the pot with his 50 cent blind, but remember, the key part of VPIP is the voluntarily aspect. The 50 cent small blind was a forced bet and when the SB folds before putting any voluntary money into the pot he will have a 0% VPIP. The BB on the other hand decides to call, voluntarily putting in an extra $4 and thus gets 100% VPIP. And lastly, the UTG open-limper decides to fold. But because UTG had already voluntarily put money into the pot with his $1 open-limp, he still keeps his 100% VPIP for the hand. Regardless of what happens from this point onward in the hand everyone’s VPIP for THIS hand is set in stone. That being said, there is one special situation that I want to discuss real quick. In this hand MP open-limps, the CO limps behind, and the BB checks his option. We know MP and the CO both have 100% VPIP in this hand, but what about the BB? At this point the BB hasn’t voluntarily put money into the pot. Remember, the blind is a forced bet so he his VPIP for this hand is currently unmarked. But if instead he bets the flop then he DID voluntarily put money in and would get a 100% VPIP for the hand. And it doesn’t matter if the big blind bets, check/calls, or even check/raises the flop…the fact that he voluntarily puts money into the pot gives him VPIP for THIS hand. with no walks he would have a VPIP of 2/5, or 40%. Over large samples, even of just 100 hands or more, we will get a nice idea on how many pots a player is voluntarily entering and we can use that information to take better lines. If we were to quickly graph VPIP ranging from 0% to 100% what we would find is players with very high VPIPs, usually 40% or higher are going to be fishy players. These players enter too many pots, usually with weak hands, and they are easy to spot with this large VPIPs. Just to visualize it, here is what 40% of hands look like, and a player who has this many hands in their range is very likely to be fishy. On the contrary players with very small VPIPs, say under 10% at full ring or under 16% at 6max are usually very nitty, only voluntarily entering pots when they have very strong hands. To visualize this, here is what 10% of hands look like. And remember, a 10% VPIP means he is playing an average of 10% from ALL positions. So he likely isn’t stealing much, doing much bluff 3betting, or getting involved in pots without great hands. In general players at 6max will have higher VPIPs. 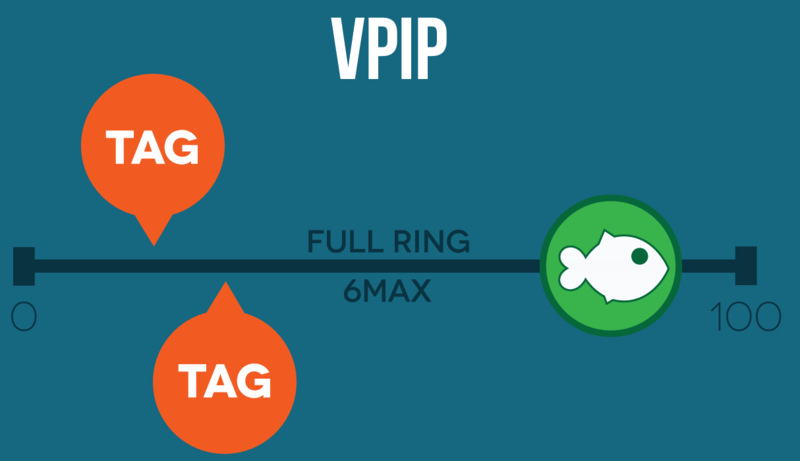 For instance, it’s common for a TAG at full ring to have a VPIP of about 15% and a TAG at 6max is usually going to be closer to 20%. But players with very low VPIPs are almost always nitty and players with very high VPIPs are more likely to be fish. Just remember to keep sample size in mind. Over a few hands a TAG could get zero playable hands and look like a nit, or get a string over hot hands and look like an aggressive fish…but over time you’ll get more hands and his VPIP will average out to a more realistic portrayal of his actual play style. For VPIP I consider 40 hands to be a broad idea, 100 hands to be a good idea, and 300+ hands to be a great idea. This is really what VPIP is used for. Getting a quick statistical idea of how loose or tight a player enters pots and using that to estimate the hands he’d play and the strength of his ranges. VPIP is the most powerful stat because it’s calculated in pretty much every single hand and gives great information while converging the fastest of any stat on your hud. And now that you know what VPIP is you can start using a hud better and finding new ways to exploit your opponents based on simple statistics! Same as always if you have any questions please don’t hesitate to let me know, otherwise good luck and happy grinding!